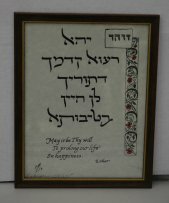 HMB Associates is proud to have been chosen as the official Internet site for displaying and marketing the products of world-renown artist, calligrapher, and alphabet-researcher -- Harvey Kaplan; a.k.a. "Habiru". 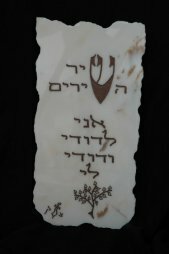 Kaplan specializes in etching ancient Hebrew and Phoenician biblical aphorisms on plaques composed of genuine Rose Aurora Italian Marble. His art career extends over 40 years and includes multi-year periods as an exhibitor and then Director of the famous Sawdust Art Festival in Laguna Beach, California. 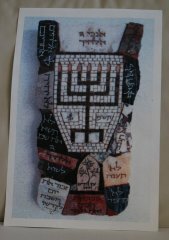 Kaplan is also a well-regarded expert on the origins of the Hebrew, Phoenician, Roman, and Greek alphabets; and his works currently can be found on six of the seven continents of the world! 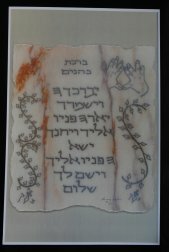 Harvey Kaplan ("Habiru") is a master at ancient-language calligraphy and etching biblical aphorisms in these languages onto genuine Italian marble. 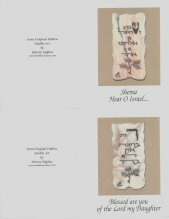 "A lifetime of diligent study and research of the ancient Phoenician and Hebrew language has inspired the creative Habiru to transcribe on bits of marble and naturally formed driftwood, sayings from the Bible, the Talmud and other ancient works. Each piece is done by hand and is an original work of art. Since 1966, the symbol of the sword has designated the authenticity of the artist's work. It was with the discovery of this Canaanite pictograph that the artist started on his long journey into the past. The pictograph of the sword is actually the starting point of the letter 'Z' as we know it today." 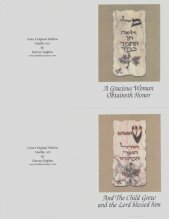 People of diverse religions and origins have had the pleasure and good-fortune of enjoying and collecting Habiru's works through art shows and exhibits; and we are extremely happy to now make his unique art forms and publications also available through the Internet medium!! 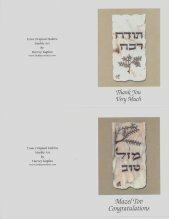 Please use our Website's feedback link or directly E-mail our HMB Associates Habiru Artworks Division -- [habiru@hmbassociates.com] -- to inquire-about or enter a purchase request for any of the above featured items. You will be contacted with the information requested and, where applicable, the ordering details. 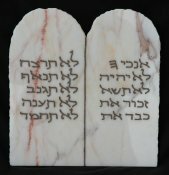 NOTE: Since all marble items are individually hand-crafted, once any of the above-displayed marble items are sold, a similar one may not be immediately (or ever) re-offered. We will, therefore, give priority to the earliest purchase request in each case. 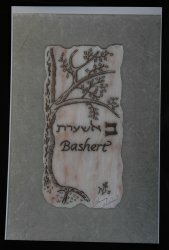 Habiru will also inscribe your custom special-request saying/phrase on a marble plaque. Please limit the saying/phrase to 10 words or less. Again, just include the desired information within your e-mail/feedback-note. Thank You. 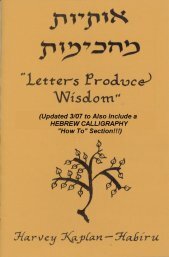 "HMB ASSOCIATES" -- "The Information People"
P.O. Box 16416, Plantation, FL 33318, U.S.A.